Chinese Nobel peace laureate Liu Xiaobo has been moved from prison to hospital after being diagnosed with terminal liver cancer. Mr Liu, a human rights campaigner, was jailed in 2009 on subversion charges for calling for greater democracy. His lawyer says he is being treated in hospital in northern Liaoning Province after being diagnosed a month ago. His wife Liu Xia has been under house arrest since her husband won the award in 2010 but has never been charged. Liu Xiaobo, 61, was a key leader in the Tiananmen Square protests in 1989. The Chinese authorities have never explained why they have restricted his wife’s movements. Mr Liu’s brother confirmed the Nobel laureate had been diagnosed with cancer on 23 May, his lawyer Mo Shaoping told the South China Morning Post. He was released days later and is now being treated in the northern city of Shenyang. “He has no special plans. He is just receiving medical treatment for his illness,” Mo Shaoping told AFP news agency. A statement from the government in Liaoning said Mr Liu had been released on medical parole and was being treated by eight tumour experts. Most people in China have never heard of Liu Xiaobo due to the censorship of discussion about him here. That it could take a month for news of his release to become public gives you an idea of the level of sensitivity. It also shows that his transfer to hospital by no means guarantees his friends and family will be able to visit. After the brutal crackdown in and around Tiananmen Square in 1989 Mr Liu was driven to the front gate of the Australian embassy and an Australian diplomat said that he had to choose in or out. He decided not to leave, believing he could be more effective trying to make change from within. This commitment to a very different China has led to him paying a terrible price. The Nobel committee described Liu Xiaobo as “the foremost symbol” of the human rights struggle in China. He never collected his prize and was represented by an empty chair. The Chinese government, which regards him as a criminal, was infuriated by the award. Diplomatic ties with Norway were frozen. Relations were normalised only last December. 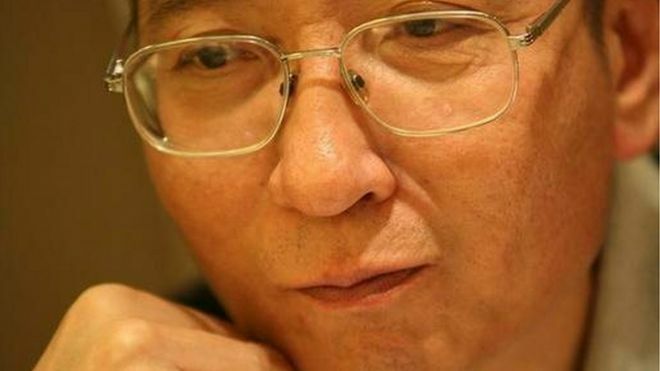 Mr Liu has three years left to serve of an 11-year sentence for “inciting subversion” after drafting Charter 08 – which called for multi-party democracy and respect for human rights in China. Amnesty International said he should never have been jailed. It urged China to ensure he received “adequate medical care, effective access to his family and that he and all others imprisoned solely for exercising their human rights are immediately and unconditionally released”.